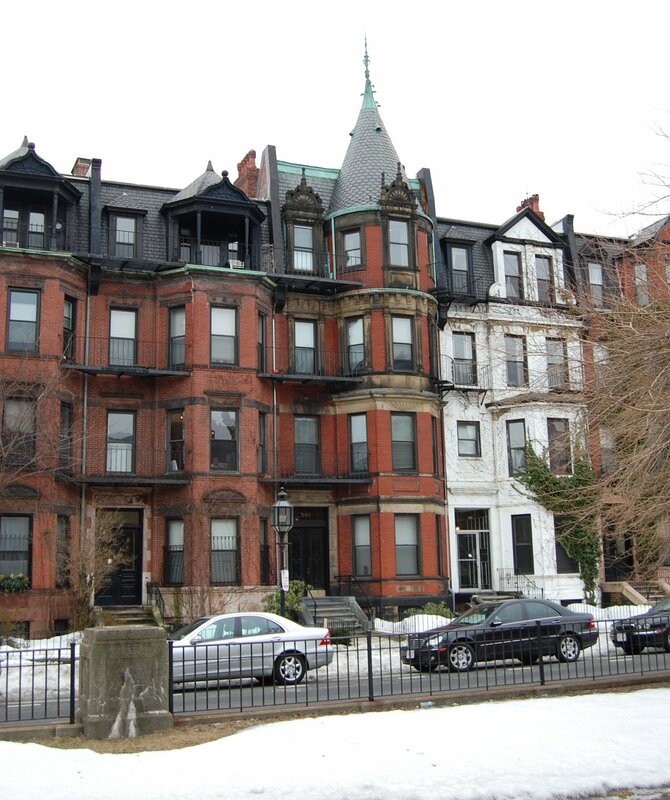 346 Commonwealth is located on the south side of Commonwealth, between Hereford and Massachusetts Avenue, with 344 Commonwealth to the east and 348 Commonwealth to the west. 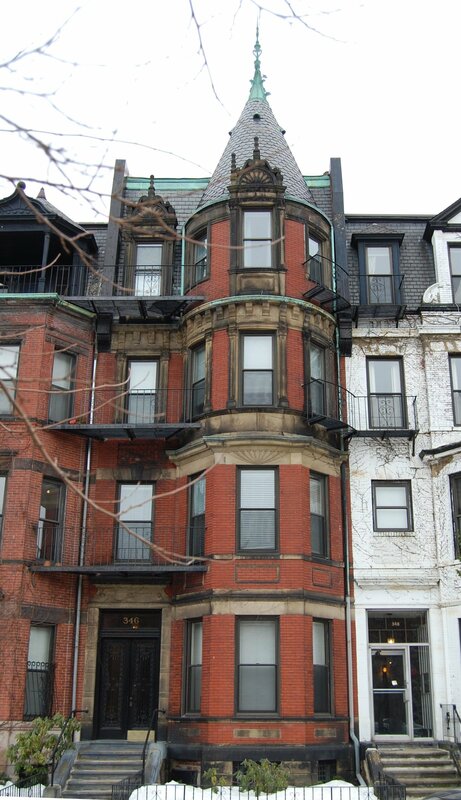 346 Commonwealth was designed by Obed F. Smith, architect, and built in 1883-1884 by Vinal & Dodge, masons, for building contractor George Wheatland, Jr. for speculative sale. He is shown as the owner on the original building permit application, dated November 10, 1883. The house was originally numbered 344 Commonwealth until about 1889, when 328 Commonwealth was built and the houses to the west of it were renumbered. 346 Commonwealth was one of thirteen houses (336-360 Commonwealth) built for George Wheatland, Jr., by Warren D. Vinal and Charles A. Dodge on land owned by Charles Merriam and by Jacob Rogers. 336 Commonwealth was designed by George Avery, 338-340 Commonwealth were designed by Bradlee, Winslow, and Wetherell, and 342-360 Commonwealth were designed by Obed F. Smith. 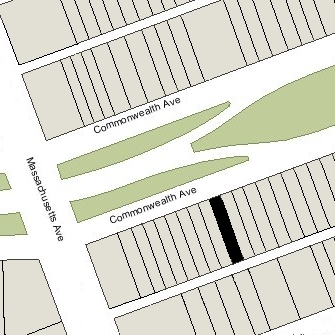 Click here for an index to the deeds for 346 Commonwealth, and click here for further information on the land on the south side of Commonwealth between Hereford and Massachusetts Avenue. On December 3, 1883, Jacob Rogers sold George Wheatland the land where 346 Commonwealth were built. On November 30, 1885, 346 Commonwealth was purchased from George Wheatland, Jr., by Lewis Augustus Roberts, a publisher and bookseller, whose firm (Roberts Bros.) published Louisa May Alcott’s Little Women in 1868. He was a widower and lived at 15 Somerset. It does not appear that he ever lived at 346 Commonwealth. In May of 1887, he married again, to Harriet Maud Gardner. 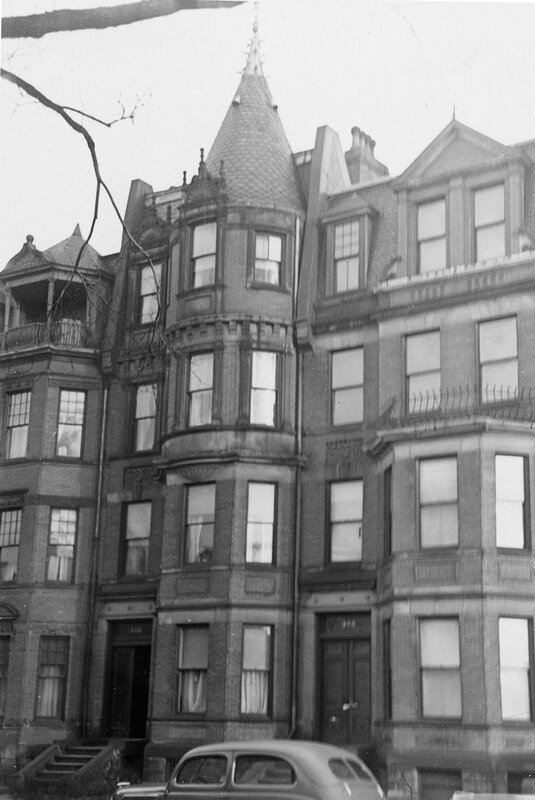 In 1888, they were living at 336 Beacon. On February 15, 1886, 346 Commonwealth was purchased from Lewis A. Roberts by banker Arthur F. Estabrook. He and his wife, Ida Florence (Fletcher) Estabrook, made it their home. They previously had lived at the Hotel Hamilton at 260 Clarendon. They also maintained a home in Swampscott. On December 4, 1888, he transferred 346 Commonwealth into his wife’s name. Arthur Estabrook died in July of 1919. Ida Estabrook continued to live at 346 Commonwealth until her death in November of 1922. On May 5, 1923, 346 Commonwealth was purchased from Ida Estabrook’s estate by her nephew, Arthur Warren Fletcher, the son of her brother, Joseph Henry Fletcher and his wife, Nellie E. (Woodbridge) Fletcher. He previously had lived in Belmont. After graduating from Harvard in 1910, Arthur Fletcher had worked for the Estabrook bank for two years and then served for two years as treasurer of the Henry Jewett Players, a Boston repertory company. By 1920, he was a stockbroker. He married in December of 1924 to Anna Griswold, and they moved to her home in Cambridge. He continued to own 346 Commonwealth, which was operated as a lodging house. By 1947, Arthur Fletcher had become a Christian Science practitioner with offices at 346 Commonwealth. He and his wife continued to live in Cambridge. He maintained his office at 346 Commonwealth until his death in 1953. By 1951, 346 Commonwealth was the home of Thomas George Barry and his wife, Adelaide Shirley (Winkleman) McCabe Barry, who operated it as a lodging house. They previously had been lodgers at 197 Marlborough. On June 9, 1954, the Barrys acquired 346 Commonwealth from Arthur Fletcher’s estate and transferred the property into Adelaide Barry’s name. They continued to live there until about 1956. By the early 1960s, they were living in Long Beach, California. On August 1, 1956, 346 Commonwealth was acquired from Adelaide Barry by the Marian Center and operated as the Convent of the Daughters of the Heart of Mary. The convent remained there until about 1969. On September 22, 1969, 346 Commonwealth was acquired from the Marian Center by Roger David Elton and John F. Flynn, Jr., and on October 26, 1971, it was acquired from them by David C. Keating. In December of 1971, he applied for permission to legalize the occupancy as a lodging house, which he noted had been the occupancy for “many years.” He subsequently abandoned the application. 346 Commonwealth was not listed in the 1972 and 1973 City Directories. On October 31, 1973, 346 Commonwealth was acquired from David C. Keating by Joseph E. Coppola, trustee of the K-C Realty Trust. By 1976, the City Directory entries indicated that it was occupied as eight apartments. On October 12, 1978, 346 Commonwealth was purchased from Joseph Coppola by Robert White. He already owned fifteen other houses on the block: 322–324–326–328–330–332–334–336 Commonwealth, 344 Commonwealth, 348–350 Commonwealth, and 354–356–358–360 Commonwealth. In December of 1988, he applied for (and subsequently received) permission to convert 346 Commonwealth from a single-family dwelling (the last legal occupancy on record with the Building Department) into nine apartments. At the same time, he also applied for (and subsequently received) permission to combine it with 344, 348, and 350 Commonwealth into one property, to be known as 344-350 Commonwealth. In May of 1989, he filed for (and subsequently received) permission to increase the occupancy of the four buildings from 17 to 35 apartments.